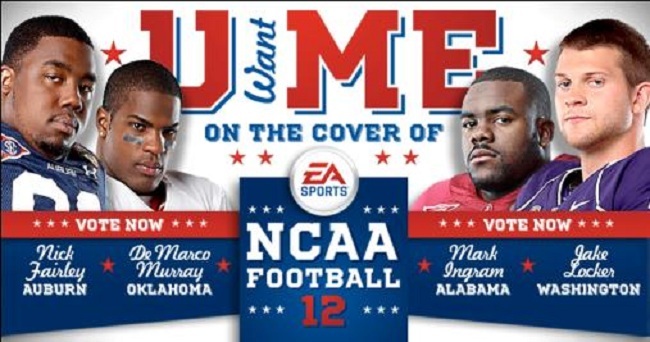 While the Madden covers have garnered more than their fair share of attention, especially when it comes to the subsequent and sometimes career ending horror that may or may not signify that the Madden curse is real, the cover of the NCAA Football titles haven’t been mystified in the same way. They are, however, a great source of pride (and bragging rights) for both the winning player and his school. Nick Fairley – Defensive Tackle, Auburn University: In 2010 Fairley was one of the most dominant defensive linemen in college football, helping lead Auburn to an undefeated 14-0 season and a National Championship. In the 2011 BCS Championship game against Oregon, a disruptive Fairley recorded five tackles, one sack and a forced fumble while being named the game’s defensive MVP. To complement his MVP honor, Fairley who recorded 12 sacks on the season, also received the Rotary Lombardi Award, given to the best lineman or linebacker in college football. Jake Locker – Quarterback, University of Washington: Locker set numerous records during his four-year stint at Washington, but may be recognized most for the immeasurable leadership he provided on the field for an up-and-coming Washington team. In his first season under center in 2007, Locker threw for more than 2,000 yards and 14 touchdowns, and ran for 950-plus yards with 13 touchdowns en route to being named Pac-10 Freshman of the Year and Freshman All-American. As a senior, Locker helped turn around a storied Washington program by leading the Huskies to a 19-7 upset victory over Nebraska in the 2010 Bridgepoint Holiday Bowl. Mark Ingram – Running Back, University of Alabama: In 2010 Ingram had the season to remember capturing college football’s two biggest prizes: the National Championship and the Heisman Trophy. During a decorated career at Alabama, Ingram rushed for more than 3,000 yards and 42 touchdowns, including 17 touchdowns and more than 1,600 yards during his Heisman Trophy-winning sophomore season. In Alabama’s 49-7 victory over Michigan State in the 2011 Capital One Bowl, Ingram capped his junior season by scoring two touchdowns and rushing for 59 yards on 12 carries. DeMarco Murray – Running Back, University of Oklahoma: Murray quickly took the Big12 by storm in 2007, scoring 15 touchdowns in his freshman season, four of which came in his Sooner debut. The 15-touchdown performance tied Adrian Peterson for a school record with most touchdowns in a season by a freshman. In his final collegiate game, Murray rushed for 93 yards on 23 carries and scored a touchdown in the Sooners 48-20 victory over Connecticut in the 2011 BCS Fiesta Bowl. Murray leaves Oklahoma holding its all-time touchdown record with 58 in four seasons. The contest is open now, and voters can head to the game’s Facebook page to cast their vote. Voting closes on April 4, and the winner will be announced on April 19.